I am pleased to report my second appearance at The Drunken Poet in West Melbourne. I had a blast there last year and this time was no different. A group of friends came to listen and the bar was full of regular clientele. My trip was planned initially to spend a day recording some demos with Lou Bradley and Phil Chafer. As a bonus, I was invited to support Lou and Phil in a private house concert and what a privilege this was. Many thanks to Leanne and Andrew for their fabulous hospitality and Clint Wilson for looking after me so well for those few days. In September, I travelled to my favourite Flinders Ranges town of Melrose, but not for the sadly missed Music Muster. When the Muster was still a thing, I discovered the perfect place for a live shoot and promised I would return. 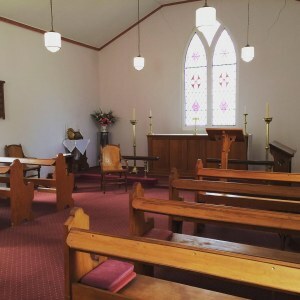 The Holy Trinity Anglican Church offers perfect acoustics and a glorious light. I knew this was the best location for a gentle murder ballad and it did not disappoint. We took advantage of this exquisite building to portray a sad tale, but one clothed in a rich ambience. Thanks goes to Fr John Fowler for arranging access and facilitating the extended time required. I engaged Reel Time Studios, with trusty camera and borrowed recording devices to shoot the footage. After several takes, we had the material to splice together a good story. Together we spent an hour selecting the best bits and were rewarded with a wonderful finished product. Almost Okay now available on YouTube for you viewing enjoyment. 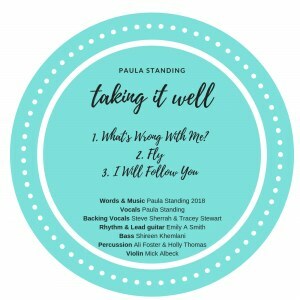 I was pleased to finally release my EP ‘Taking It Well‘, because these songs have been burning a hole on my shelf since 2017.. 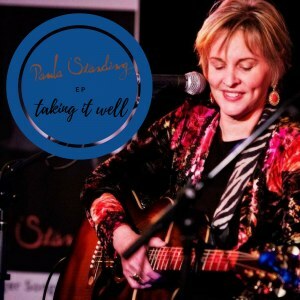 These songs deal with stories of people dealing with crazy situations but still, ‘taking it well’. ‘Fly’ is dedicated to two Australians executed in Bali and how they turned their lives around in prison. The tracks have been downloaded by a number of radio stations and played on various shows across the country. I was also able to feature it as guest artist on Radio Adelaide‘s Songcatcher program. Launched from The Wheaty, supporting Clint Wilson, from Melbourne, who was touring his LP Dark Water. Well this year I made my debut appearance at the Semaphore Music Festival. Monday October 1, saw me on the BSide Community Stage in Mundy St, Port Adelaide. 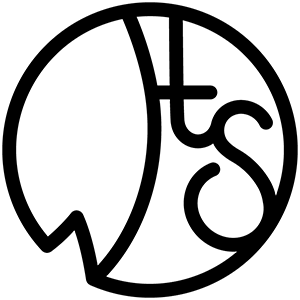 I kicked off the Monday lineup and was followed by Dave Robinson; Amy Jennifer; Moose Hair; James Hickey and Kylie Brice. An equally awesome lineup was inside Hart’s Flour Mill. Lovely close to a fantastic festival. Matt Ward asked me to be the guest at The Three Brothers Arms in Macclesfield on his Annabelle single Launch Tour. We had a grand night entertaining the locals in this delightful country pub in the Adelaide Hills. What a spectacular venue and restaurant, make sure you check this one out. Hot news: With the mastering complete, we are not far off producing the new EP. 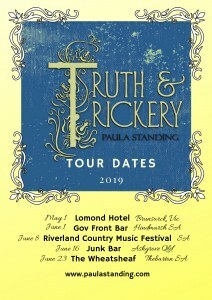 Courtney Robb is finalising the artwork and dates are being booked for a Truth & Trickery Launch and Tour! Hot on the heels of our 2018 Umbrella show, ‘Two Chics and A BOOM!’ Emily A Smith and I went into Wizard Tone studios and began recording. We were joined by Holly Thomas, who flew from Melbourne and drummed up some excellent percussion. Local bass diva Shireen Khemlani and the wonderful Emma Luker added bottom and top to the mix. I was back in the studio a few weeks later to add the final vocals and talk about the feel. When Emily returned to Adelaide for work, she finished off guitar parts and added the backing vocals. Richard Coates, local keyboard player has brought some ivory tinkling to three of the tracks and things are really starting to sound complete. We had a great time working with James Brown, because he has been extremely helpful with suggestions along the way. Chic Chic Boom was launched to radio, with the help of Emily A Smith and myself during 2018 Umbrella Festival. We presented the show from the awesome Wheatsheaf Hotel with a full band in tow. With an underbelly element, this was an evening of retribution showcasing new and old tracks we have worked on together over the past few years. Emily launched her own original music into the public arena. The night began with a laid back semi-acoustic set, later joined by a band of local musicians which set the crowd buzzing. What a fun night ending on a spectacular and off the cuff version of House Of The Rising Sun. Many thanks to the appreciative audience for coming out on a cold and rainy night.